No I’m not encouraging you to betray our sister planet to the outside. 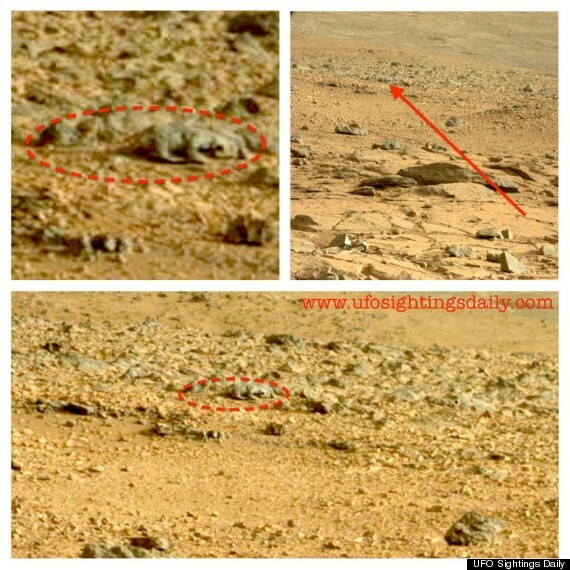 Nor is there such a thing as a rat on Mars or anything that remotely resembles one. However there is this picture from NASA. I don’t remember downloading it but there is a credit on one of the pictures. If it’s really NASA, of course it’s public property. Anyhow what was said was that there was an appearance of a rat like thing. I thought it was sufficiently interesting so that I included it in my session at the Necronomicon. It seems to me that there are two kinds of things to think about. The first category has to do with Mars. What it is? Well it’s a trick of light and shadow, of course. But I am slowly coming to the attitude that there are things I just don’t know, to which I can only assign a probability of fifty percent. Then there are things I think I know. But I have been wrong or have been misinformed with such regularity that I probably should not give anything credit beyond two to one for. Thus I cannot disbelieve things beyond one to two either. That means even things I don’t believe might merit discussion if there is enough information. Well there isn’t much information here; it’s just the one picture. But let’s go with it. First, it is no rat. The body is too long for the girth. The face is flat. The tail is too stout. The limbs are out of proportion to the body. It has no fur. But saying that much concedes that there could be an “it” in the first place, which I do not believe. Trick of the light, as I said. If it were anything it would be much more like an iguana. So let’s toy with that for a bit. The most successful body plan for a terrestrial animal is the beetle shape. It is low, flattened on the bottom and longer than wide. This plan gives good structural strength for its weight and allows for good mobility. There are more species of beetle alive to day than any other species. The plan dates back to the amazingly successful trilobites, includes cockroaches and even is seen in the design of the modern car including the most widely recognized car of all, the original Volkswagen. The second most successful body plan is the lizard shape. That dates back to the Devonian era, something like twice as far back as the first dinosaur. There have been things of the general lizard plan ever since. So as body plans go, if you were to try to create a hoax – and I don’t think it is a hoax – you could hardly do better than try to put over an extra-terrestrial beetle or lizard. Every terrestrial tetrapod, going right back to the Devonian era, begins as an embryo in a shape that would let it clap hands and clap feet. Then the elbows rotate backward while the knees rotate forward. That’s good. If it comes to a fight the elbows and knees are vulnerable. Keeping them in is a good thing. But the creature-like shape shows the knees turned backward. That’s not the best plan, but it would work well enough. And for hoax purposes it would be a good way to plant the idea that it is not of this earth. And another thing to notice is that it is green. If you go out on a clear night and can see Mars it is visibly red. It is a rather faded shade of good old Georgia red clay, which is that color because of the oxidized iron it contains and the same thing holds for the red of Mars. And of course Mars has winds and no rain so things are inevitably terminally dusty. Some of the foreground rocks are a bit greenish, but nothing in the picture looks as green as “it.” So the suspicion arises that it is able to dust itself off. Iguanas are green, unless they are very old in which case they are more like the color of Mars, and their green color is easily explained as camouflage. But “it” isn’t camouflaged at all. It would have to be green for some other reason. The light from the sun is dim out Mars way, but the color is about the same. If you wanted to capture the sun’s energy you’d use a green pigment just as plants do here. So there “it” is, basking in the sun. Now it doesn’t take much energy to stay alive. Some turtles can sink to the bottom of a freezing lake and remain for months in a state of at least partial vigilance but suspended animation. So consider a Mars that was wet in the past and might have had some vegetation. You’d think they’d have traces of that, but let’s go with it. The place dried out, the plants did poorly and whatever animals there were ate the last of the plants. Some of the animals, under extreme selective pressure, developed the ability to do photosynthesis in their skin. Of course I use “animal” and “plant” as analogies here. They wouldn’t really be part of the kingdoms we are familiar with. So there basks the lizardy sort of thing slowly accumulating energy stores in preparation for some very brief physical activity. So far it sort of hangs together. Then things get bizarre. The first pulsars were called LGM’s for “little green men.” It was thought that their amazingly accurate timing as they gave off their periodic bursts of energy suggested a mechanism and hence a designer of such mechanism. But it turned out that they are all slowly spinning down so a more mundane explanation was invoked. But green? Nowadays when we are shown putative extra terrestrial humanoids they are white. They are called “greys” but they look whiter than white folks. I sniff the stale odor of racism. The little green men have turned into tall white men, the better to impress us. But if we go with the traditional small and green, then it would go along nicely with “it.” Prolonged inanimation and green color would be the default setting for Mars. That brings us to an unhappy speculation regarding the much acclaimed – if illusory – alien craft that is said to have crashed near Roswell, New Mexico. The “occupants” were little and appeared to have been dead despite no truly catastrophic injuries. But if “they” came from a Mars-like biome then their automatic reflex when under stress would be to go into suspended animation and let the body recover its energy stores. So they looked dead to us … and we dissected them. Oh dear. We should have noticed that there was no dependent lividity indicating the circulation was shut down, put them in a cold, high CO2 environment and given them gentle treatment with a sun lamp. We weren’t thinking. One might reflect that the distinction between large plants and large animals which is so obvious on our planet may not be universal. If it is cold enough and the sun is dim enough so that activity is severely limited an intermediate form might be optimal, both plant an animal for practical purposes. So if a strange looking little green man shows up claiming to be from Mars check out his knees. This is not to say I think the image is other than a trick of the light, but I do think it is enough to warrant a second look. If it did prove to be alive that would be more important than the rest of the whole expedition. You can estimate the chance of it being alive extremely small and you still have to contend with the fact that the chance of finding anything useful with the Mars program was probably always a lot smaller. So why didn’t they go back for another look? I suppose the project is run by people who have been successful in furthering their own careers. Every step on the way has been optimized to promote those in control. Turn up a lizard and the whole ball game changes. Now different experts are called in. The original plans are dropped and those who are benefiting from them take a hit in their prestige, exactly where they will tolerate no hit. So they ignored it. Alas although I don’t think the picture tells us anything about life on Mars it certainly seems to tell us something about life here. There have been 61 visitors over the past month.